In this Winter Window the snow really falls! This is a great craft for preschoolers and kindergartners to practice their scissor skills, but all children will love watching the snow fall! The Winter Window is symmetrical, turn it either way and the snow will keep falling! 2. Cut out the template and trace it onto a piece of construction paper. On a sky blue piece of paper trace around only the outside of the window to make the solid background rectangle. 3. Put 1½ tablespoons of sugar into your baggie. Seal the bag, but make sure you don't squeeze out all of the air or the snow won't fall right. Test the snowfall, you can add more or less air to your bag if you need to. 4. Get all the sugar into the center of the bag. Sandwich the baggie between the two papers by spreading glue along the edges of the baggie, front and back. Also spread glue on the outer edges of the paper window. 5. 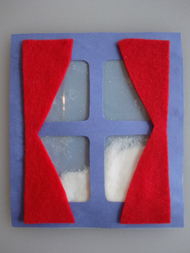 Trace around the curtain template onto a piece of felt or paper and glue in place on your Winter Window. Once all the glue is dry you can turn your window to make the snow fall!